WASHINGTON (CNN) -- As President Bush prepares to announce an increase in the number of U.S. troops fighting in Iraq, some Democrats say they would consider blocking funding for the escalation. When asked whether Congress would consider cutting off the funds, Senate Majority Leader Harry Reid said, "We're going take a look at it, of course." Sen. Barack Obama, D-Illinois, said his "office is now investigating what tools are available to us to condition or constrain appropriations" for the surge in troops. But he cautioned he doesn't want troops already in Iraq to be "shortchanged." "So it creates a difficult situation for Democrats," he said. Aware of this concern, House Speaker Nancy Pelosi, D-California, told reporters at a Capitol news conference Monday, "Democrats will not cut off funding for our troops." But, an aide later explained, the speaker is open to restricting money for the escalation, after hearings on the president's new plan. "We will always support the troops who are there," Pelosi said on CBS's "Face the Nation" Sunday. But, Pelosi added, "If the president wants to expand the mission, that's a conversation he has to have with the Congress of the United States. Bush is scheduled to introduce his new Iraq strategy Wednesday night. Until now, most Democrats vowed not to curtail funding for the troops -- considering the move risky both for the troops and for their own political fortunes. But at least one Republican senator -- Gordon Smith of Oregon, who previously has expressed misgivings about the direction of the war -- said he would be open to cutting off funds for an escalation if it could be done without harming troops already in the field. A group of senators was invited to the White House to hear the president's pitch ahead of his Wednesday prime-time speech to the nation, when he's expected to announce an increase of 20,000 or more troops, plus economic and political incentives. Sen. John Warner, R-Virginia, the former chairman of the Armed Services Committee who was briefed on the plan by Bush on Friday, said the plan is worthy of serious consideration and he hopes lawmakers will study it carefully before judging it. Warner declined to discuss the specifics of the still-secret plan. Regardless of what Democratic leaders decide about funding, Sen. Joe Lieberman, a Connecticut independent who organizes with the Democrats, predicted most Democrats won't support cutting off funds for the troop increase. Lieberman held a news conference with Sen. Lindsay Graham, R-South Carolina, to release a letter they sent Bush urging him to send additional troops to Iraq. At the news conference, Graham implored Congress not to propose cutting off funding or capping troop levels. Doing so would be "proposing defeat," he said. 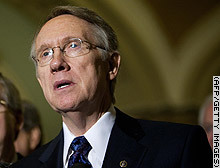 Last week Senate Majority Leader Harry Reid said Democrats will "take a look at everything" in regard to war funding.